I arrived in Glasgow in the evening. I took carry-on luggage only. I dropped my bag in my hostel room. I used the Euro Hostel and I would highly recommend it. It was clean, quiet and people were friendly. I booked a single room with two twin bunk beds and a private bath and shower. After dropping off bags I headed for dinner. I found a restaurant that I had seen in youtube vlogs called Bill’s. I knew the food would be good. But the restaurant was so cute. The restaurant atmosphere was casual and the décor was fun. I couldn’t decide what I wanted so I had the salmon cakes and a side of the truffle mac n cheese. They were both excellent! I had dessert of lemon meregrine cheesecake. All the food and service was great. I went fairly early in the evening for dinner around 6’ o clock. The restaurant wasn’t really busy yet, the staff were all very nice and accomidating. I even went back in the morning for breakfast because I knew the food was good and the breakfast menu looked good. I had avocado toast and a side of a poached egg for breakfast. I had a cup of coffee and a green smoothie. On the schedule was to visit the Glasgow University and the Hunterian Museum. 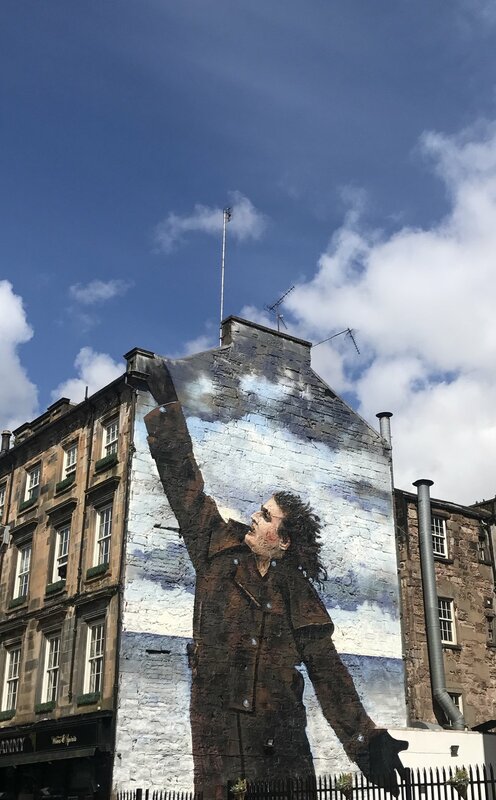 Then possibly check out the Glasgow lighthouse and some of the street art. I took a taxi to the university because it seemed to be a ways a way and it was raining pretty hard that morning. I walked around the university and it was quiet. The architecture is absolutely gorgeous and was truly magical. It’s easy to see how the university was an insoiration for the school of Hogwarts in Harry Potter. The Hunterian Museum is located on the campus grounds. The entrance was free and it’s really worth a look around. They have a mummy, skeletons, fossils, gemstones and various other early scientific instruments. After exploring the university I made my way to the Glasgow city lighthouse. The lighthouse has some beautiful views overlooking the city. It so happened that the street art that i wanted to see was down the street from the lighthouse. The majority of the street art is done by an artist called Rogue One. I had so much fun exploring the street art scene in Glasgow. We did a lot of shopping in Glasgow in the evenings.